This is just the beginning of a debate about the right way to move forward with the Space Force, says Brian Weeden, a space expert at the Secure World Foundation, a nonprofit that specializes in space security. Creating a new branch of the military is going to require a lot of complicated bureaucratic reshuffling. “The other piece of it is, how do we create something that is going to placate Trump while doing what actually needs to be done,” Weeden said. On Monday, multiple outlets reported that they had received an internal memo, signed by US Air Force Secretary Heather Wilson and dated September 14th, that said creating both a Space Force and a unified space command would cost $3.3 billion for fiscal year 2020. 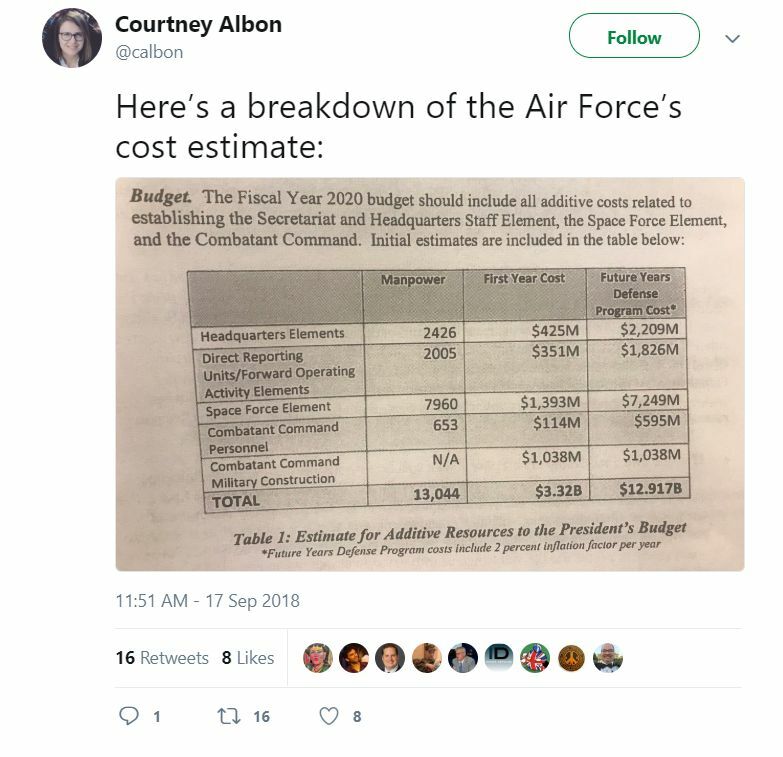 The memo, tweeted out by Inside Defense reporter Courtney Albon, showed that more than 13,000 new personnel would be needed, as well as a five-year budget of $12.9 billion. That’s a lot of money to create a separate branch of the military that would effectively do what the Defense Department does now. The DOD has launched many satellites that do surveillance, missile detection, and communication. And the people who oversee these technologies are spread throughout the Department of Defense, situated in the Air Force, the National Reconnaissance Office, and the Navy. The Space Force, presumably, would take the people working on space missions within those branches and put them in one central branch. But the leaked memo seems to be calling for a bunch of new people and infrastructure, in addition to what the military already has. “Reading through the remarks, it seems she’s talking about those people stay there now, and we add a bunch of new people and new budgets,” Weeden says. Of course, this memo only refers to what the Air Force thinks will be needed to create a Space Force. No one told the Air Force to come up with an estimate, but Secretary Wilson said it was the branch’s duty. “As airmen, we have a responsibility to develop a proposal for the president that is bold, and that carries out his vision,” Wilson said on Monday during the Air Force Association’s annual Air, Space and Cyber Conference. But the Defense Department may ultimately choose to completely disregard what the Air Force suggests. We won’t know what the real arrangement will be until President Donald Trump’s budget request comes out in February. “It’s all part of the process — seeing the sausage being made,” Marcia Smith, a space policy expert and founder of SpacePolicyOnline.com, tells The Verge. But other people see this leak as an attempt to derail the Space Force, since it’s harder to get Congressional support for an expensive idea. “This is the highest estimate I think you could possibly come up with,” Todd Harrison, a budget analyst at the Center for Strategic and International Studies, told reporters on Thursday. WHAT ABOUT THE AEROSPACE FORCE INSTEAD? Meanwhile, the Air Force Association, a nonprofit organization that promotes the Air Force, released a paper on Monday, arguing against the Space Force. 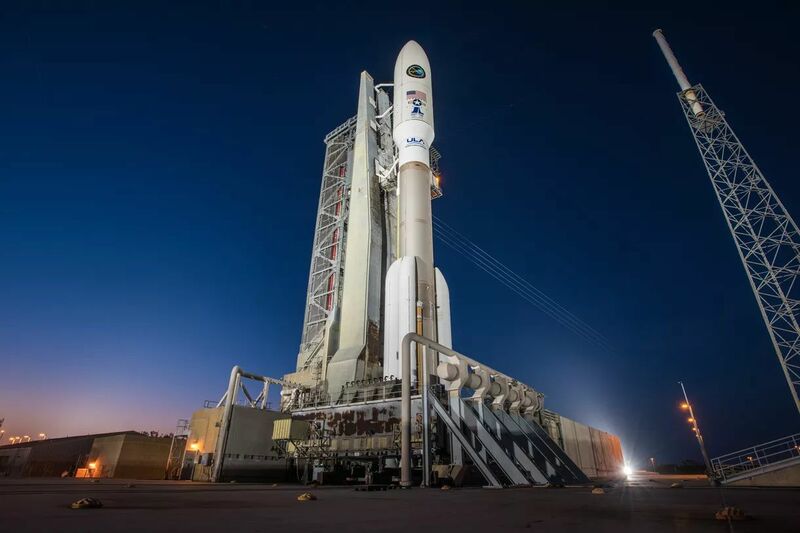 The group argues that the Air Force has been managing most of the military’s space missions for decades now and those capabilities shouldn’t be taken away. Instead, simply rename the Air Force to the Aerospace Force, the group argues. It’s a move that makes sense for the nonprofit, since supporting the Air Force is their top priority, according to Weeden. “It was not surprising that an institution that supports the Air Force would be against taking away a significant amount of people and mission from the Air Force,” he says. However, the AFA does make a few good points. The organization argues that there is a strong link between air and space technologies, which is why the two should stay under one branch. Many of the technologies needed for aircraft are used in spacecraft as well. NASA develops both kinds of technologies; it is the National Aeronautics and Space Administration, after all. The AFA also argues that there aren’t any weapons that have been developed and deployed in space right now. Most of the military’s space assets revolve around information gathering and communication. “Currently there are no space arms which are fundamental to setting up an armed service,” the AFA said in its statement. Deputy Defense Secretary Patrick Shanahan gave a speech at the Air Force Association’s Air, Space and Cyber Conference on Wednesday, where he said that creating the Space Force is a “complicated process.” Mainly, no one agrees about how the branch should be structured, he said. Combining warfighting with procurement seems like a strange move, says Weeden. Those two functions are separate elsewhere in the military, with different chains of command. One is the organize, train, and equip function, or OTE, which involves making decisions about the types of equipment and technologies the military needs and then training personnel to use those technologies. This is what the Air Force, Navy, and Army do, and technology acquisitions fall under these branches as well. The warfighting chain of command is responsible for deciding how to implement the technologies and personnel that the military branches comes up with. Warfighting is done under the US’s unified chains of command, such as Centcom or USStratcom. Meanwhile, not everyone is sold on the idea of a Space Force yet, and with midterm elections coming up, the makeup of Congress could shift very soon. That might put Space Force’s chances in jeopardy, especially if more stories about soaring budgets come out. Still, nothing is certain until the president’s budget request is published next year, which is when we’ll get a definitive breakdown of the Space Force structure and cost. Then it’s up to Congress to decide whether they want it.